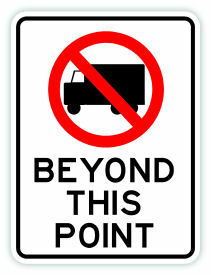 "No Trucks Beyond This Point Sign" alerts drivers that trucks are no longer allowed beyond the point indicated. This sign helps ensure safety and traffic order. 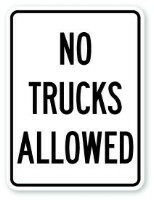 Insuring extended sign life, our "No Trucks Beyond This Point Sign" is made from 24" x 18" .080 Aluminum Sign with Standard 3/8" Mounting Holes Centered Top and Bottom. Each has a reflective sign face option achieved by applying 3M HIP reflective material.